Launched in 2012, the NUNCHUK 370 Precision Shaft for hybrid clubs delivers unmatched performance and accuracy for those long shots into the green. The NUNCHUK 370 utilizes the same Tour-proven NUNCHUK Tri-Zonal Stability (TZS) design as the original NUNCHUK. TZS incorporates three segments, or zones, where each segment is specifically designed and constructed to control problems with twist, flex and droop found in other shaft designs. The NUNCHUK TZS design helps the golfer by making it easier to hit the sweet spot, with the clubface aligned with the intended ball flight, time and time again ... better performance, better accuracy! 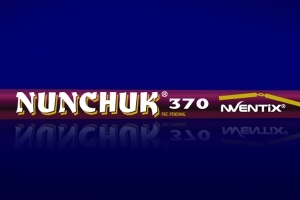 NUNCHUK's have been proudly played by more than 60 PGA Tour players and in-the-bag of multiple winners and involved in many Top 10 Finishes and millions of dollars in winnings.